The CMAT Spinal Rehab team from Trillium hospital poses with colleagues from Holy Family Hospital in Rawalpindi. March 9, 2006: The Trillium Hospital (Mississauga) neuro/rehab and physio teams released an initial report of their activities in Pakistan from January to February this week. An estimated 1,500 quake victims lie in hospitals in Rawalpindi and Islamabad with Spinal Cord Injuries (SCI). Before the CMAT Rehab team arrived, these paitents were lying in beds without active physio or rehab interventions. 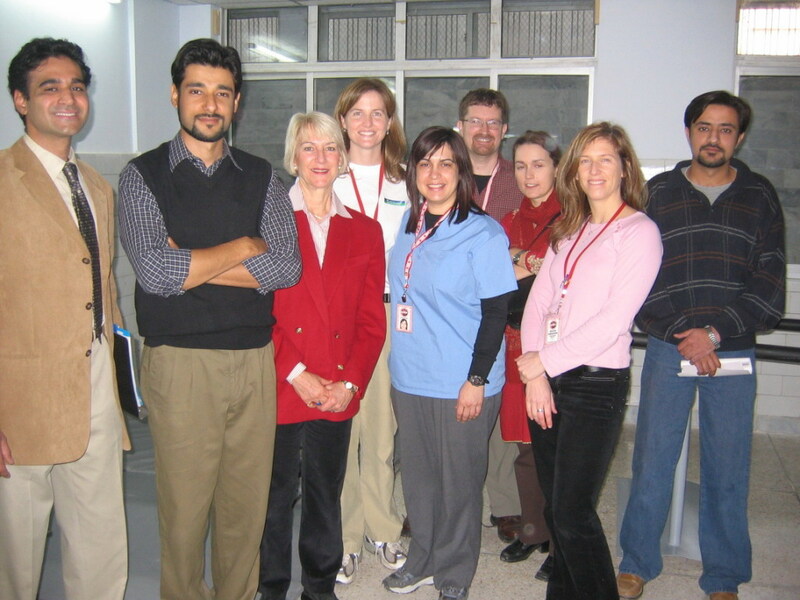 CMAT Rehab teams worked with the NGO Subh-E-Nau at the Holy Family Hospital in Rawalpindi. 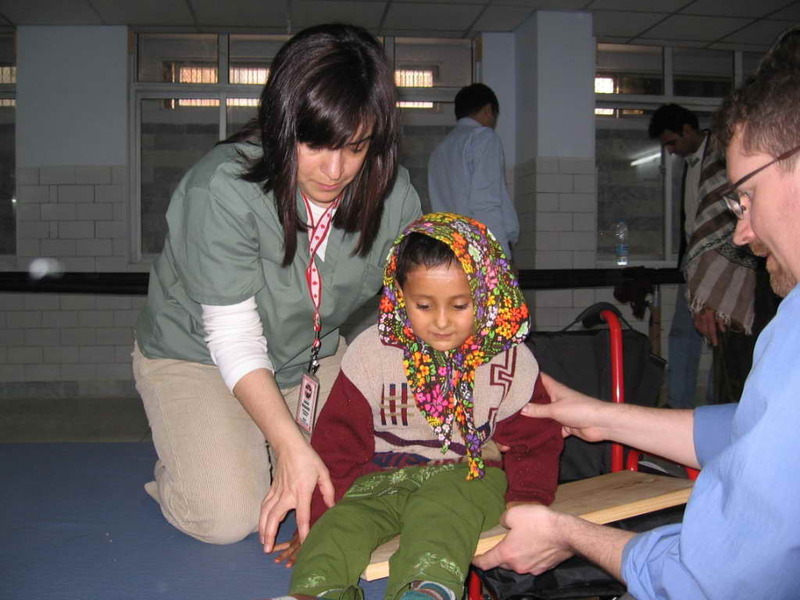 Sarah & Rob teaching L.A. (3 y/o from Muzaffarabad with complete spinal cord injury) slide board transfer from a mat to her wheelchair. Provide immediate rehabilitation to persons with spinal cord injuries (the greatest need for foreign expertise), and orthopaedic injuries. Treat and prevent progression of medical and functional complications of prolonged bed rest: pressure ulcers, contractures, muscle tightness, muscle weakness, kyphosis (curvature of the spine), etc. Identify learning needs of local physiotherapists and provide training and learning opportunities. A.S. trying out custom back cushion made by CMAT rehab volunteers to accomodate spinal deformity. An orthopaedic physiotherapist worked with a local physiotherapist to see orthopaedic patients at Holy Family Hospital (Rawalpindi), as well as the H11 Tent Camp (Islamabad), Muzzaffarabad camps and Abass Hospital (Muzzaffarabad). The CMAT Rehab team of 4 therapists (OT and PT), focused on spinal cord rehabilitation at Holy Family Hospital in Rawalpindi and developed the rehab program, training activities for local staff, and treatment plans for each individual patient. In addition the CMAT Rehab Team identified the resources for education and training for local staff and patients and families. The CMAT Rehab team saw 10-18 people with spinal cord injuries daily, as well as outpatients from the community. Patients received approx. 1-1.5 hours of therapy per day.